← Storm Flood and Water Damage – Things you should know! Each year, more than 4,000 Americans die in fires, more than 25,000 are injured in fires, and more than 100 firefighters are killed while on duty. Eighty-three percent of all civilian fire deaths occurred in residences. • Fire is FAST. In just two minutes, a fire can become life-threatening. In five minutes, a residence can be engulfed in flames. • Fire is DARK. Fire produces gasses that make you disoriented and drowsy. Instead of being awakened by a fire, you may fall into a deeper sleep. Asphyxiation is the leading cause of fire deaths, exceeding burns by a three- to- one ratio. • Fire is HOT. Heat and smoke from fire can be more dangerous than the flames. Inhaling the super-hot air can sear your lungs. • Install smoke alarms. Properly working smoke alarms decrease your chances of dying in a fire by half. 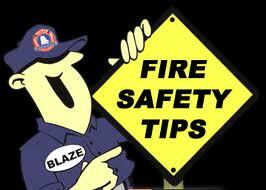 • Place smoke alarms on every level of your residence, including the basement. • Install a working carbon monoxide detector in the common area of the bedrooms. • Test and clean smoke alarms once a month and replace batteries at least once a year. Replace smoke alarms once every 10 years. • Never leave cooking unattended.• Always wear short or tight-fitting sleeves when you cook. • Always wear short or tight-fitting sleeves when you cook.• Keep towels, pot holders and curtains away from flames. • Keep towels, pot holders and curtains away from flames.• Never use the range or oven to heat your home. • Have an escape plan. Review escape routes with your family.• Make sure windows not nailed or painted shut. • Make sure windows not nailed or painted shut.• Teach family members to stay low to the floor, where the air is safer, when escaping from a fire. • In high-rise, never lock fire exits or doorways, halls or stairways. Never prop stairway or other fire doors open. • Place space heaters at least three feet away from flammable/combustible materials. • Use only the type of fuel designated for your space heater. • Keep matches/lighters away from children. • Never smoke in bed or when drowsy or medicated. • If you must smoke, do it responsibly. • Make sure outlets have cover plates and no exposed wiring. • Make sure wiring does not run under rugs, over nails, or across high-traffic areas. • Do not overload extension cords or outlets. • Check closed doors with the back of your hand to feel for heat before you open them. • If the door is hot do not open it. Find a second way out, such as a window. If you cannot escape through a window, hang a white sheet outside the window to alert firefighters to your presence. • When there is a phone in the room where you are trapped, call the fire department again and tell them exactly where you are. • Check the door is cold slowly open it and ensure that fire and/or smoke is not blocking your escape route. If your escape route is blocked, shut the door and use another escape route. • If clear, leave immediately and close the door behind you. Be prepared to crawl. • If you are with a burn victim or are a victim yourself call 911, cool and cover your burns until emergency units arrive. • When you are a tenant contact the landlord.